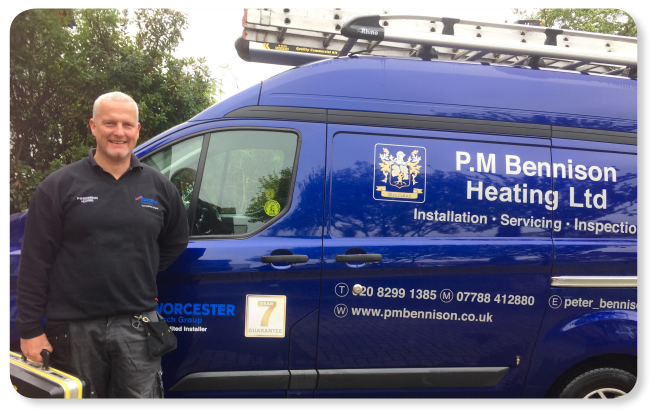 P.M Bennison Heating Ltd is owned and managed by Peter Bennison, who has been running the company for over 14 years. Peter is an accredited installer for Worcester Bosch and is Gas Safe Registered, qualified and insured. Peter and his small team of professional, qualified and insured gas heating engineers are certified to work on domestic boilers, cookers and fires. P.M Bennison Heating Ltd are based in Beckenham after many years living and working in East Dulwich. They work locally in the South East London area. P.M Bennison Heating Ltd take pride in the quality of their work. Peter and his engineers are reliable, conscientious, friendly, efficient and honest. P.M Bennison Heating Ltd have many happy customers throughout South London, as witnessed by the numerous recommendations on the East Dulwich forum (please see our testimonials page for further reviews). A central heating consultation, specification and installation service. Worcester Bosch "Accredited Installer" parts and labour warranty of up to 10 years for newly installed Worcester Bosch boilers. Boiler servicing and landlord’s gas safety inspections and certification. Boiler and heating system diagnostics and repairs. Unvented "mega-flow" hot water systems. Please contact us today to arrange a no obligation consultation and quotation service, where Peter can help you choose the right system for your property and your specific needs. I've lived in East Dulwich for 10 years and really struggled despite word of mouth and the ED forum to find high quality, reliable and essentially that old school of tradespersons who know their craft and take pride in their work. Every bit of contact with Peter Bennison and his team was perfect. Totally reliable, early, went to lengths to ensure I did not request unnecessary work, incredibly reasonably priced, and even jeopardised seeing the World Cup semi final without complaint to ensure the house was left immaculate. I am beyond delighted with every aspect of their work and could not recommend highly enough. I would recommend that anyone looking for a boiler and its ongoing care doesn't think of looking further than here. "Peter Bennison was recommended to us and over the last year he has done a variety of work on the boiler/ heating systems for two properties. The work ranged from servicing the boiler and providing gas certificates to troubleshooting when the boilers/heating systems needed urgent repairs, replacing parts and balancing the system. He also provided very helpful advice on how best to run the systems to ensure maximum efficiency. We have always found Peter (and his team) to be extremely responsive, efficient and professional to work with and have no hesitation in recommending his services to others. Our properties are in SE22 and SE15." "Peter, we'd like to thank you for your efficiency, punctuality and tidying up. The service from you and your team was faultless. Should you need any client references in the future we’d be more than happy to help. Thank you." "Peter and his team came to install a combi boiler for me. The work was done very efficiently and neatly – and the few inevitable issues that arose during the job were dealt with calmly and fully with a high quality of workmanship. Peter even brought similar bricks to the existing ones to fill in the gap left by the vent of the previous boiler so the new bricks blend in well with the old ones. The person who lives in the flat below me was also most impressed that Peter's team hoovered the brick dust off some of the plants in his garden before they left! I would definitely recommend Peter and P M Bennison Heating."